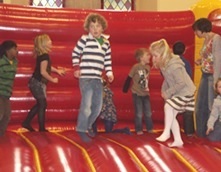 It’s our annual Children’s Ministry Fun Day between 2pm and 4pm this Saturday 10th January, at the church building in Coxwell Street. This is open to all the children who are part of our Children’s Ministry on a Sunday (3 year olds to Year 6 – if you are a parent of a 2 year old in Little Sparks then your child is very welcome to come, but please could an adult stay with them – as we are unable to give them the attention they will require with big 11 year olds around – thank you). For those of you that haven’t been before… there will be lots of fun things for your child/ren to choose to play – Wii, crafts, Lego, train track, table tennis, pool, play-doh and a bouncy castle! There is no cost for them to come – but there will be a tuck shop for them to buy things from (so feel free to give them a small amount of money). We will provide squash and biscuits. This is a really good opportunity for your child to get to know others within their groups and develop friendships – it also gives us a chance to get to know them better too.